I Wake Up Dreaming continues (which sounds better than "I will continue to wake up dreaming") through Sunday. Then, after three festival-free days, the San Francisco Silent Film Festival and the Green Film Festival both open on Thursday. A- The Grand Budapest Hotel, Lark, opens Friday. Once again, Wes Anderson is playing with us, and I at least enjoy it immensely. 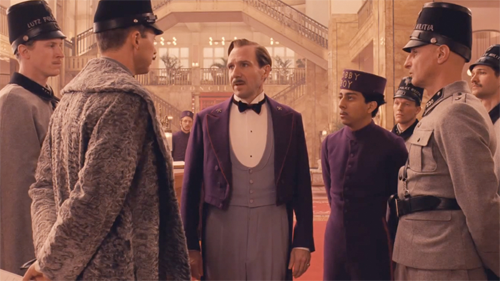 In this story within a story within a story, the concierge of a magnificent European hotel (Ralph Fiennes) takes a young bellhop under his wing and teaches him about hostelry and life, while also trying to save his skin from some very well-connected thugs. All quite silly, except that I think there’s a message about the rise of Fascism in there somewhere (the innermost story is set in the early ’30s). The hotel, which sits on a high mountain’s peak, is one of those places that you want to visit but could only exist in a movie. This is the sort of picture where the local newspaper is called The Trans-Alpine Yodeler. A+ Fred Astaire Double Bill: The Band Wagon & Top Hat, Stanford, Saturday and Sunday. The A+ goes to Top Hat. But I give a very high A to The Band Wagon, easily The best Fred Astaire vehicle without Ginger Rogers. What sets it apart is a small dose of reality in the otherwise frivolous mix. For instance, Astaire’s character, an aging movie star nervously returning to Broadway, is clearly based on Astaire himself. You’ll find no such echoes of reality in Top Hat. From the perfect clothes to the absurd mistaken-identity plot, to the art deco set that makes Venice look like a very exclusive water park, everything about Top Hat screams "Don’t take this seriously!" 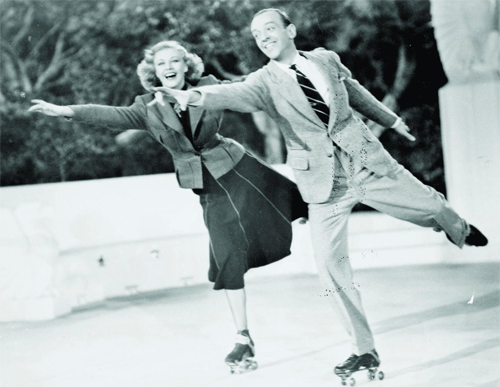 But who needs realism when Fred Astaire dances his way into Ginger Rogers’ heart. B The Four Horsemen of the Apocalypse, Castro, Thursday, 7:00. 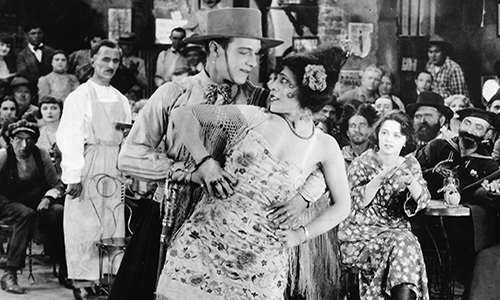 Rudolph Valentino danced, female hearts fluttered, and a star was born. Aside from that justifiably famous tango sequence, the lavishly-produced Four Horseman makes for an entertaining evening. This World War I epic follows two Argentinian families who find themselves on different sides of the European war. The antiwar message is significantly diluted, however, by an insistence on blaming everything on the Germans. Musical accompaniment by the Mont Alto Motion Picture Orchestra. Opening night of the San Francisco Silent Film Festival. A Shall We Dance (1937), Stanford, Wednesday through next Friday. 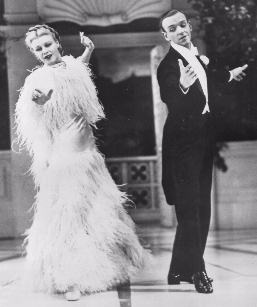 Along with Top Hat and Swingtime, Shall We Dance represents the best of what Astaire and Rogers had to offer. The story–¦well, who cares about the story. The only collaboration between Astaire, Rogers, and the two Gershwins gives us “They All Laughed,” “Let’s Call the Whole Thing Off,” dancing on shipboard, dancing on stage, dancing in roller skates, and the most romantic song ever written, “They Can’t Take That Away from Me.” When Fred and Ginger aren’t singing or dancing, Edward Everett Horton and Eric Blore provide plenty of comedy, with light satire aimed at celebrity scandals and the culture gap between ballet and popular music. On a double bill with another Astaire/Rogers vehicle, Carefree; I saw it long ago and wasn’t impressed. B+ Comedy Short Subject Night, Niles Essanay Silent Film Museum, Saturday, 7:30. One great short comedy and three good ones. The Cure is arguably the funniest of Charlie Chaplin’s 12 Mutual shorts, and that’s saying a lot. It’s also an excellent example of his rich drunk character. Fatty Arbuckle’s The Bellboy (with Buster Keaton in a supporting role) is little more than a string of gags, but enough of them work to make it enjoyable. In High and Dizzy, Harold Lloyd gets drunk and walks along a skyscraper’s edge. Moderately funny and historically interesting. Made before Laurel and Hardy officially became a team, Do Detectives Think? comes very close to being a fully-mature L&H short. Greg Pane accompanying everything on piano. A Spirited Away, Yerba Buena Center for the Arts, Thursday, 7:30. Hayao Miyazaki’s masterpiece is a beautiful, complex, and occasionally scary tale of a young girl cast into a strange and magical world. The intriguing and imaginative creatures, not to mention the moral dilemmas, are beyond anything that Dorothy ever had to deal with in Oz.. A truly amazing work of animation. Part of the series Astonishing Animation: the Films of Hayao Miyazaki and Studio Ghibli. C- Harry Potter and the Sorcerer’s Stone, Balboa, Saturday, 10:00am. Although entertaining, the first Harry Potter novel showed little of the power, complexity, character, wit, and entertainment value of the sequels. The first Harry Potter movie, trying desperately to be as faithful to the book as possible, showed even less. Skip the movie, read the book, and then read the rest of the books. Then you can enjoy the later movies, as well. F Indiana Jones and the Temple of Doom, Clay, Friday, Saturday, and Sunday, midnight. 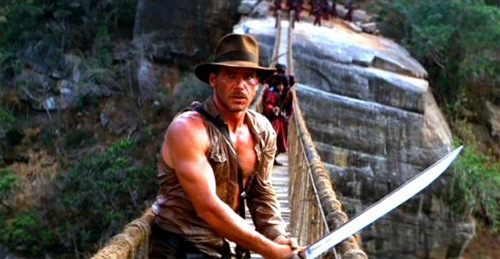 Absolutely the worst Indiana Jones movie ever. First, Spielberg and company tried to make it dark and atmospheric, but only succeeded in making it unpleasant. Second, leading lady Kate Capshaw may have captured Spielberg’s heart (they’re still married), but her performance here is as enticing as nails on a chalkboard. And finally, the movie is horribly, irredeemably, D.W. Griffith-level racist. Two years after Attenborough’s Gandhi,Spielberg and Lucas assure us that India needed white people to protect the good, but helpless and child-like Indians from the evil, fanatical Indians.